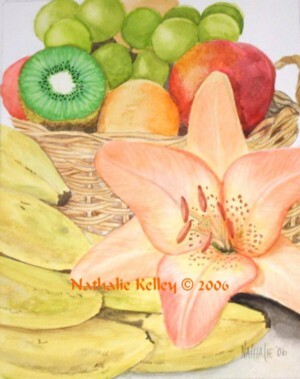 The basket filled to overflowing with fruit and the lily that graces the edge of the scene were begging to be painted. I think that this reflects the way that God would have us to live, filled to overflowing with His Spirit displaying the fruit of His Spirit. The kiwi represents an openness and trust. The lily is a reminder to "Consider how the lilies grow. They do not labor or spin. Yet I tell you, not even Solomon in all his splendor was dressed like one of these. If that is how God clothes the grass of the field, which is here today, and tomorrow is thrown into the fire, how much more will he clothe you, O you of little faith!” Luke 12:27-28.